This weekend, I’ll be moving my blog over to inhabit my other blog site, Living The Seasons. I’ve had the name for three years, but did very little with it. When I started this blog at dogear6, it was meant to be a fun little photo thing to help me learn to blog. I’d planned on putting my more substantial posts over at Living The Seasons. Well, that didn’t quite go as planned and this has become much more substantial than I expected. I like the other name better for long-term blogging and have decided to transfer over to it. I experimented last weekend with a test blog and it seemed to transfer over just fine. For those of you with E-mail subscriptions, WordPress follows, or RSS feeds, you’ll need to subscribe again. Links to my blog will also have to be updated. I HOPE YOU FOLLOW ME. I appreciate everyone who has taken time to stop by, like a post, or leave a comment. I will also put a redirect on this blog for a while. My understanding is that if you click on it, it will automatically take you to the other blog. I will send a note letting everyone know when it becomes a done deal. If something goes really wrong, I will not hesitate to remain at www.dogear6.com either. Interested in seeing how my blog has matured? Here’s my first post, with a picture of a young beagle. The word that day was WAFT. 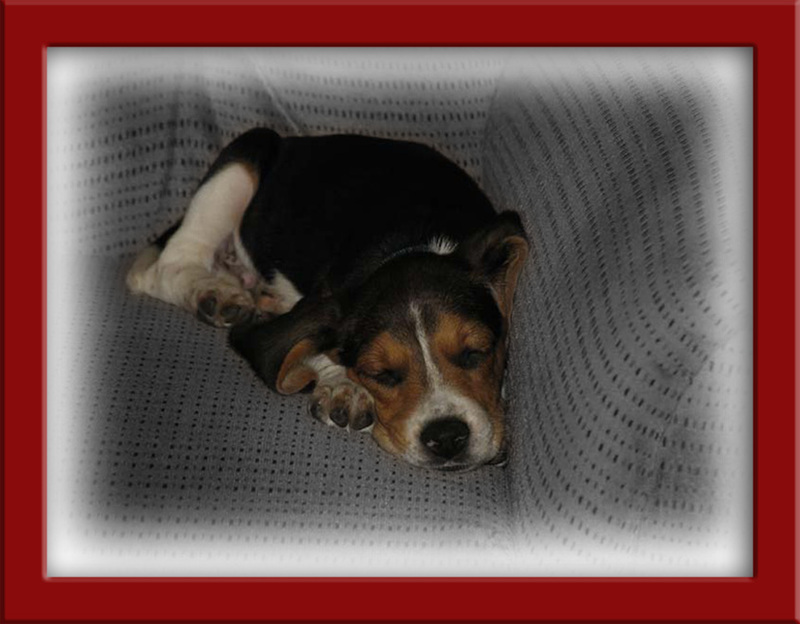 Here’s another picture of a baby beagle, using Photoshop skills from an on-line class that I was taking at the time. Doesn’t he have the most gorgeous colors? The black on his face is mostly gone and there’s a fair amount of white on his face as well. Word for tomorrow – HUGE. And I truly hope that is not the word I use after moving my blog around. I didn’t know you were talking about at first because I read Dec. 11th’s post first. Serves me right for getting things out of order. I will put this on my google reader the next time I’m at my computer. Working from my iPad right now, and some things are just a lot easier with a full-fledged keyboard. I love the header. Does this mean you’re not going to be picking a word every day? I’ll be doing a word a day through the end of the year. I don’t plan on doing it next year though. It’s a little too limiting, although look at the volume of my blogs, it’s not impacted my creativity. Good point. That is what I hope to use. I have had a bookmark for Living The Seasons for some time. Now I have signed up to follow you there. Thanks Kitty! You’re the greatest.